to execute much of the same key Oracle database functionality that Toad for Oracle offers but from within your automated DevOps. Let’s get started. Who is this guide aimed at? You should be comfortable reading and writing basic Python as well as having experience with Oracle databases. If you receive an error that goes something like… ‘pip’ is not recognized as an internal or external command, operable program or batch file. You’ll need to add it to your system path. More on that here. You can grab the script that’s available here or you can open a text editor or Python IDE and create a new file named tdt_codeanalysis_example.py and add the code below. Our script only needs to do a few things. Specify an Oracle connection string, create a Toad DevOps Toolkit instance, supply a few code analysis options, and execute. # Import win32com.client so that we have easy access to COM interfaces. # Connection information used to connect to your Oracle database. # Start Toad DevOps Toolkit. # Create and assign a Toad DevOps Toolkit connection. # Set code analysis report information. # Set database object information to analyze. Line 2: Import pywin32 to provide access to Toad DevOps Toolkit’s COM interface. Line 5: Create an Oracle connection string. This will be unique to your database setup. Line 8: Create an instance of Toad DevOps Toolkit. Line 11–15: Create a new connection from your connection string and specify some default reporting options. Line 18–21: This is the database object that we’ll be running analysis on. This will be unique to your database setup. 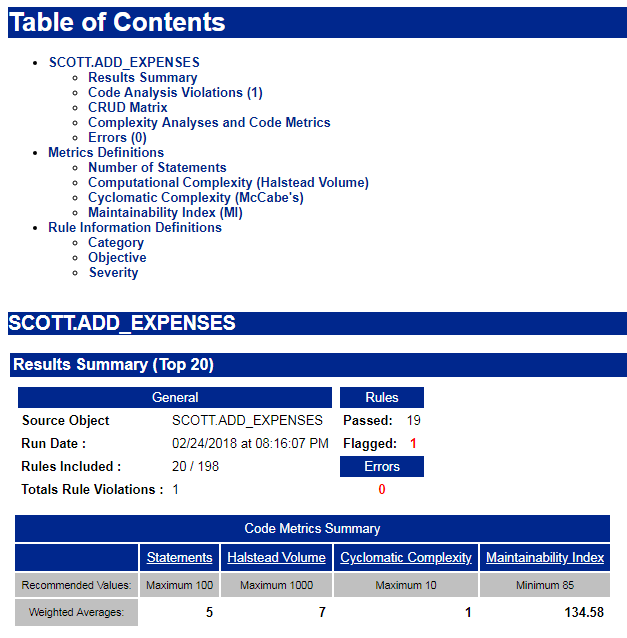 Line 24: Execute code analysis using the options provided. Line 26: Exit Toad DevOps Toolkit. When running your script if you receive the error… ImportError: DLL load failed, check out this post (it’s an easy fix). That’s all there is to it. Hopefully this is pretty straightforward, especially if you’ve used Toad for Oracle’s Code Analysis in the past. I hope this has inspired you to take a look at adding automated database code analysis to your DevOps pipeline. If you have any suggestions or questions let me know in the comments or on our forum. The full script is available here and more Toad DevOps Toolkit information can be found here.